i think i found my love for the kitchen through my mom. We cooked together a lot, or at least I followed her around and watched her throw together an entire meal in just 30 minutes. Dessert-wise, we dabbled a little in cake mix cakes and cake rolls that ended up being cookie-like. One thing we managed to succeed in were Rice Krispies. They started off as crunchy bits of cereal stuck together with marshmallows. 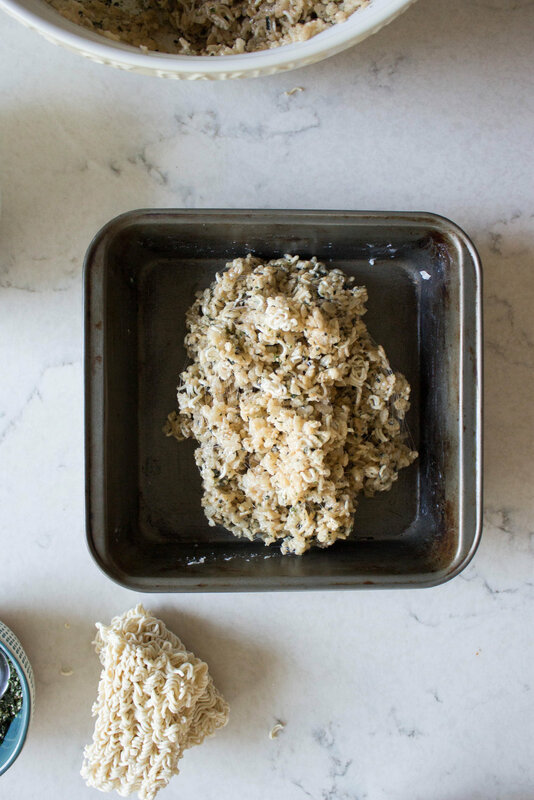 We couldn't understand why our rice krispies always ended up so crunchy, but we later realized that not mixing together the marshmallows and the cereal over a hot stove made crispy rice krispies. But one of the fondest memories from making rice krispies with my mom was using a wet rice paddle to scoop out the sticky bits of cereal from the bowl and to press the cereal mixture into the pan. she came out with the idea actually, and it was genius! We never ventured past plain Rice Krispies, but ma, any variation of these treats will always remind me of me of you. 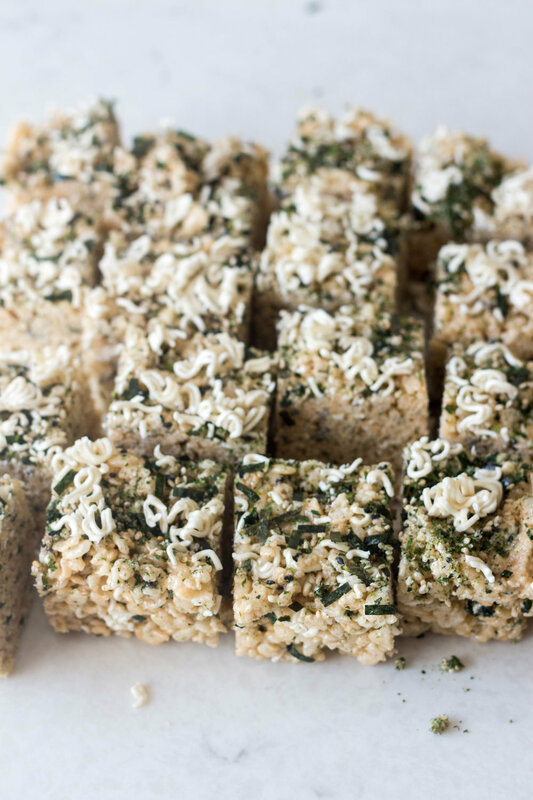 These ramen furikake rice krispies combine even more of my childhood memories with dried ramen pieces, which i used to coat with ramen seasoning packets, and furikake, which i used to mix with rice. Yes, dried ramen from Top Ramen packs, and furikake, the salty seaweed seasoning. And yes, mixed with marshmallows and cereal. 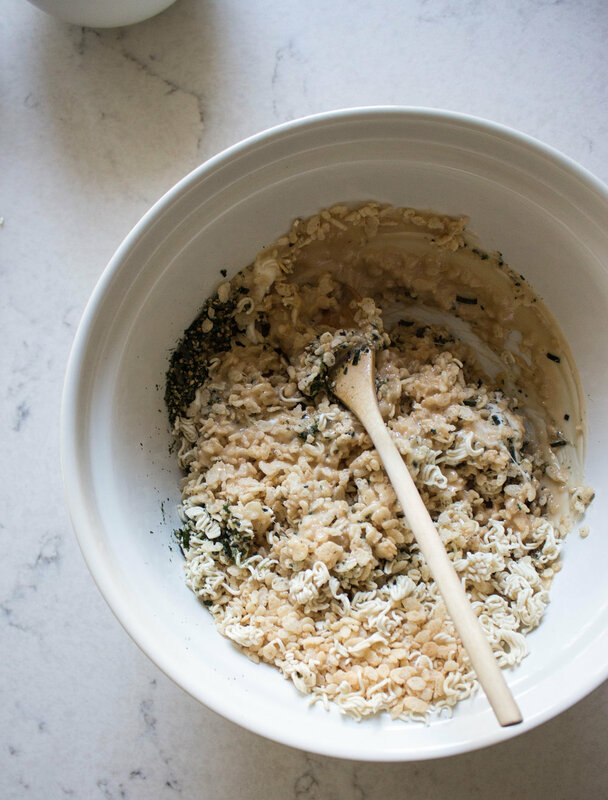 mix together melted mallows, cereal, ramen, and furikake seasoning. stir to combine! quickly. and fight the stickiness! gently. 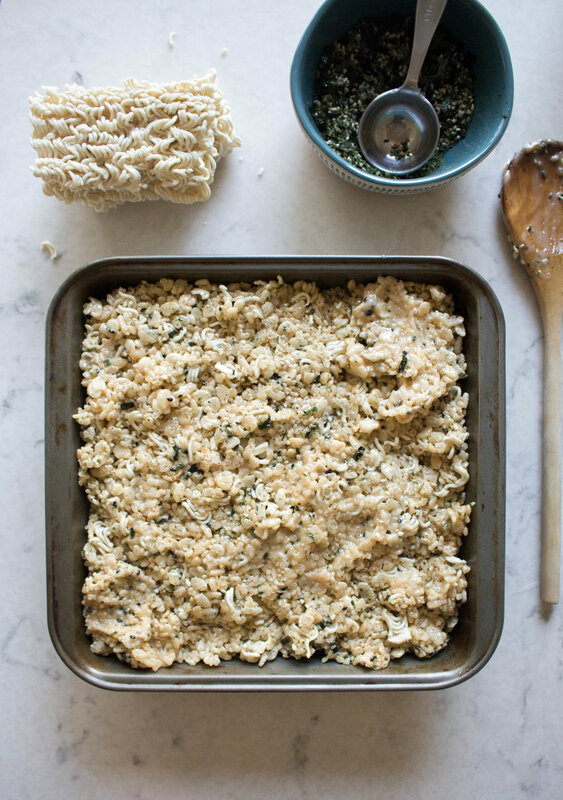 press into a well-greased pan. sprinkle with more furikake seasoning and ramen!!! aaaaand slice. consume. and share, maybe. 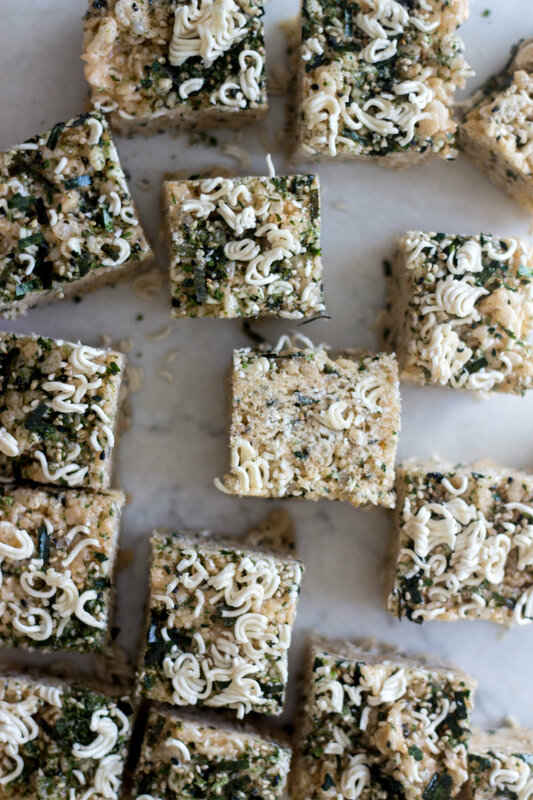 baker's notes: Feel free to use half the amount of furikake if you don't want the seaweed flavor to be that prominent. in a medium saucepan over medium heat, melt together the butter and marshmallows. stir constantly until it's all melted and smooth. while the marshmallows and butter melt together, stir together the cereal and 1 package of crushed ramen noodles. don't forget to keep an eye on the marshmallow mixture! pour the melted marshmallow mixture into the cereal-ramen mixture and 4 tablespoons of furikake seasoning. working quickly, stir together until everything is well-combined. spoon the mixture into the greased pan- it'll be sticky! using a rubber spatula (i run it under water first) or wet hands, prep the mixture into the pan. sprinkle with half a package of crushed ramen noodles and the remaining furikake seasoning. press the toppings slightly into the pressed mixture. let harden for at least an hour before slicing and serving! enjoy! !